November 2013: The following conversation is set against the background of intersections in African American navigation of African cultural and value systems within the competing world of Africa (globally) and Africa American dialectic. Following Professor Afolorunso Dairo's (Religious Studies Department, Redeemer’s University, Nigeria) presentation entitled "The ‘Known Devil’ and the ‘Unknown Saints’: Christianity and African Cultural Heritage", audience engagements included contributions by Professor Jacqueline Grant (Interdenominational Theological Center, ITC, Atlanta Georgia), Professor Ademola Dasylva (English Department, University of Ibadan, Nigeria), Nigeria. The presentation was moderated by Dr. Charles E. Thomas (Interdenominational Theological Center, ITC, Atlanta Georgia). November 2013: Colin Dube gives a presentation on the role of the Auburn Avenue Research Library in the preservation of African American African heritage and value systems amidst the threats of cultural and existential annihilations. November 2013: Colin Dube gives presentation on the role of the Auburn Avenue Research Library in preservation of African American African heritage and value systems amidst the threats of cultural and existential annihilations. November 2013--Professor Dasylva Ademola Omobewaji was Guest Speaker at the conference "A Biography of Darkness." Dasylva is Professor of African literature and Oral literature, poet, biographer, literary theorist and critic; coordinator of Ibadan Cultural Studies Group, (a study group for the promotion of excellence in African and African American cultural studies); convener, 2008 Ibadan International Conference on African Literature (IICAL); convener of The Toyin Falola Annual International Conference on Africa and The African Diaspora (TOFAC); Fellow, Salzburg Seminar, Session 374, Austria, 2000. Prof. Dasylva is a native of Ado-Ekiti (Aduloju family), Ekiti State; attended Our Lady & St. Kizito's Catholic Seminary, Ede, Osun State. B.A. Hons, (English) and M.A. (African Literature), University of Ife (now Obafemi Awolowo University) Ile-Ife; Ph.D in African Literature, from Nigeria’s premier University of Ibadan, Nigeria. Prof. Dasylva teaches Drama, Poetry, the African Novel, and Oral Literature/Folklore Studies at the Department of English, University of Ibadan, Nigeria. His scholarly publications include, Understanding Wole Soyinka: Death and the King’s Horseman; Studies in Drama; Classificatory Paradigms in African Oral Narrative (a monograph), and co-edited with Prof. Kola Owolabi Forms and Functions of English and Indigenous Languages in Nigeria; co-author (with Dr. Toyin Jegede), Studies in Poetry. His collection of poems, Songs of Odamolugbe won the 2006 ANA/Cadbury National Award for Poetry, and one of the finalists in the 2009 NLNG Literature Award. In March 2009, at the Africa Conference, Professor Ademola Dasylva won the 2009 Distinguished Africanist Award for Research Excellence, University of Texas at Austin, USA. He is well traveled and widely published in local and international scholarly journals. In this introductory remark Olali David raises the pertinent question, "What is African heritage? ", as a vista into interrogating African African reconstructions of the past. Olali David talks about the compelling force of belief, religious and irreligion alike! 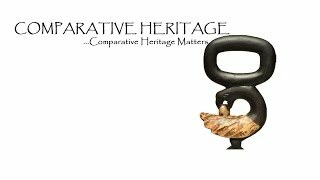 Comparative Heritage curates memory and history through material and spirituality forms.